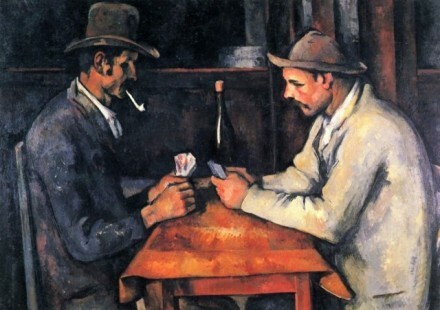 The royal family of Qatar has just publicized its $250-$300 million purchase of Card Players by Paul Cézanne. The work is one in a series of five, but until now was the only one remaining in private collection. Previous owner, Greek shipping mogul George Embiricos, became receptive to the sale just prior to his death in 2011. Vanity Fair reports that William Acquavella and Larry Gagosian were outbid for Card Players, at comparable amounts rumored up to $220 million. Even the low estimate of $250 million, factoring in exchange rate and tax fees, marks the highest sum in history ever paid for a single work of art in either auction or private sale by double. 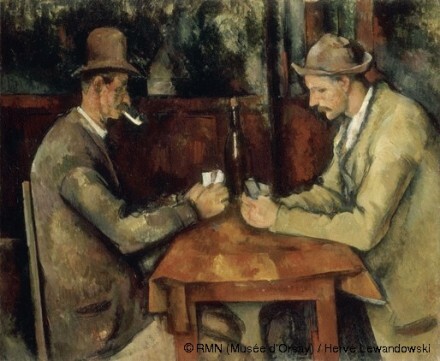 As the title indicates, the series depicts two low-brow card players in Aix-en-Provence. The peasants idealize an old world culture, nostalgic even to the middle-aged artist when he painted from his family’s country estate in the 1890s. At the time, Cézanne was working alone, and his isolation reflects in the sparing surfaces and minimal compositions of the varying card scenes. Only the subtlest of changes differentiate one painting from the next: most notably, the cards themselves change as the games progress, while the faces and suggestively sluggish interactions do not. The five Card Players paintings are all accounted for in collections at the Metropolitan Museum of Art in New York, the Musée d’Orsay in Paris, the Courtauld in London, and the Barnes Foundation in Philadelphia, and now Qatar. 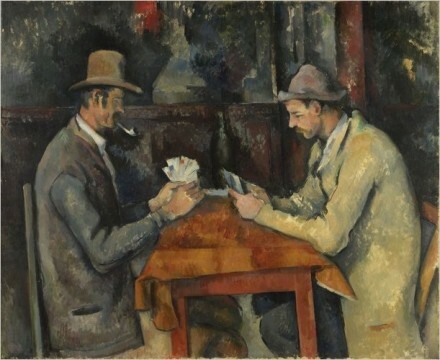 Last winter, “Cézanne’s Card Players” opened in New York, with cooperation from a preceding exhibition at the Courtauld Gallery in London. Allegedly, the ongoing showcase expedited dealings between the Qatari royal family and private owner Embiricos. Card Players notwithstanding, Qatar has been building a relationship with prior Christie’s heads since then-Chairman Edward J. Dolman transitioned to executive director for the Qatar Museums Authority (QMA) in June 2011. The QMA continues to oversee developments of the recently opened Museum of Islamic Art (2008) and Arab Museum of Modern Art (2010). A National Museum of Qatar is slated to open in 2013. Sheikha Al Mayassa bint Hamad bin Khalifa Al-Thani, the daughter of the Emir of Qatar, is the official head of the organization. She continues to headline as a noted art collector globally, and will inaugurate the opening of Takashi Murakami’s work at the Museum of Islamic Art on February 9th. Qatar funded Takashi Murakami’s previous exhibition at the Palais de Versailles. This latest Cezanne transaction has the ability to restructure the entirety of global art valuations. During negotiations, Qatari royals enlisted the assistance of G.P.S. Partners (for Franck Giraud, Lionel Pissarro and Phillipe Segalot.) Segalot is noted to have aided the acceleration of Francois Pinault‘s private collection. Pinault currently owns Christie’s auction house, despite rumors of a bid for the company by Qatar in 2010. The family was also advised for Card Players by Guy Bennett, former co-head of worldwide Impressionist and modern art at Christie’s. Like the potential bid for Christie’s, the high-end Cezanne purchase is an attempt to link global markets: aligning with New York, Paris, and London institutions undeniably continues the mission to solidify Qatar’s role as an international art hub. However, despite the ever-expanding progress and profits of well-oiled territories in the Middle East (pun intended, as the region is rich in oil wells) sensationalize in ostentation, abounding wealth comes at financial and legal costs. In 2005, Qatari collector and cultural minister Sheikh Saud Al-Thani was arrested on charges for misuse of public funds, despite his estimated overall purchasing worth at more than £1 billion. Nearby emirate Abu Dhabi has delayed its museum building for its Louvre, $27 billion Zayed National Museum, and Guggenheim openings to 2015, 2016, and 2017 respectively from original 2013-2014 deadlines, due to reevaluation after economic prosperity in Europe during conceptual years. Previous high-value purchases by Qatar are numerous. Both The Art Newspaper and Business Insider report the Sotheby’s purchase of Mark Rothko’s White Center (Yellow, Pink and Lavender on Rose) for 72.8 million in 2007, making it the highest auction price ever paid for a post-war artwork. Although not for a single work, Qatar paid $310 million for 11 Rothkos previously owned by New York financier J. Ezra Merkin, after his business dealings with Bernie Maddoff. 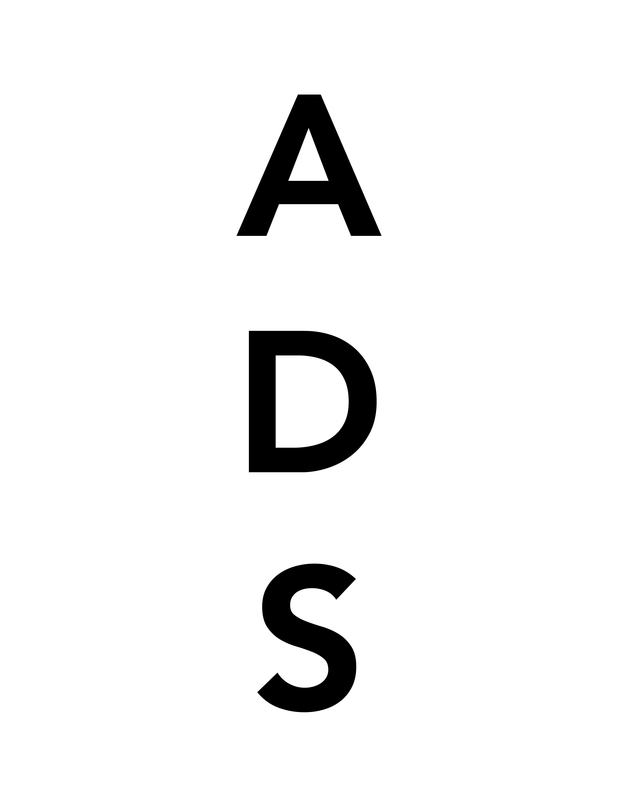 This entry was posted on Thursday, February 2nd, 2012 at 9:34 pm	and is filed under Art News. You can follow any responses to this entry through the RSS 2.0 feed. You can leave a response, or trackback from your own site.